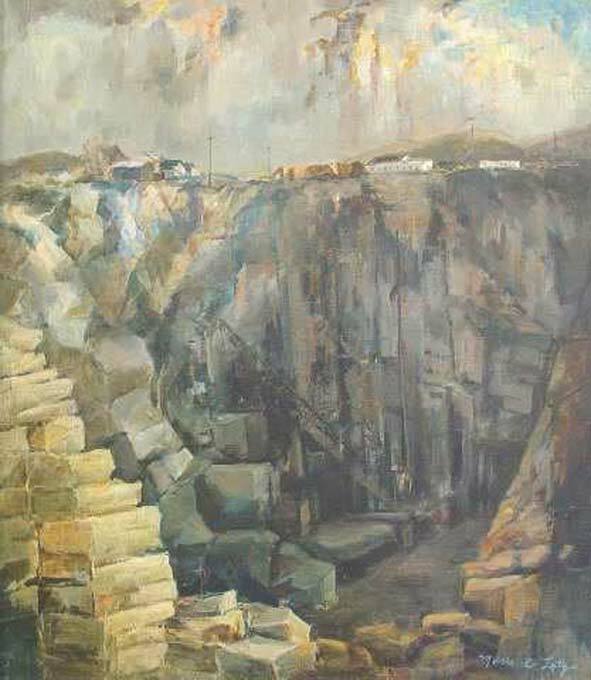 Stone Quarry | Kappa Kappa Kappa, Inc.
“Stone Quarry” by Marie E. Lutz was the ninth painting selected for restoration. Purchased in 1963 for $175 and now valued at $2,250. The painting is 28”x32” and shows a crane at the bottom of the pit, a shed, and an office at the top. Mrs. Lutz wrote, “An artist must always continue to be a student, never let your art knowledge stand still, pick up new ideas and medium, create your own style and use your imagination. My sketch books are full of sketches made on painting trips with ideas for future use-but rarely used without rearranging to make a better composition. Sometimes two or three sketches are combined. A thin wash of color is a help if the picture is to be painted in the studio.” This is how “Stone Quarry” developed, from sketches made from quarries of Bloomington and Bedford in Indiana and Athens in Ohio. Marie E. Lutz majored in Art at Miami University in Oxford, Ohio. She studied with several John Herron instructors as well as with Charles Burchfield of New York, William Thon of Maine, Hilton Leach of Florida, John Taylor of New York, and Chapin of Chicago. As a teacher she taught oil, water, and mixed media classes.